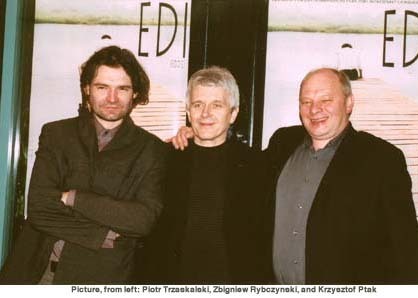 On January 9, 2003, the Minister of Culture of the Republic of Poland, and representatives of Opus Film Studio, Tumult Foundation, and Consulate General of the Republic of Poland in Los Angeles, presented a special ceremony and reception for Conrad Hall, ASC, and Krzysztof Ptak, PSC, celebrating the Golden Frog Prize, 2002 Camerimage Festival winners for films "Road To Perdition" and "Edi" (Eddie). The ceremony and screening of Piotr Trzaskalski's film, "Edi," Poland's official entry for the 75th Annual Academy Award, took place at the Academy of Television Arts and Sciences in North Hollywood, California. "The Camerimage Jury unanimously decided to award two first prizes to Conrad Hall in recognition of his superb craftsmanship and great talent demonstrated in Road To Perdition, and Krzysztof Ptak, for Edi, recognizing that even if the cinematographer is forced by monetary reasons to use inferior equipment, a spirited cameraman is able to create a beautiful film," said the Camerimage jury president Chris Menges." Haskell Wexler, fellow cinematographer, presented a speech for the occasion as tribute to Hall. Conrad Hall filmed 35 films. He and two classmates formed a production company and sold the project to a local television station. Hall's company branched out into making industrial films and TV commercials. They were hired to shoot location footage for several feature films, including Disney's "The Living Desert" series. There was a minute of silence. Conrad Hall past away on January 4th, 2003. His son Conrad W. Hall received the Golden Frog Award for his father and presented a 7 minute film about his father's work. Conrad Hall was born in Tahiti in 1926. Studied filmmaking at USC. He received his first cinematographer credit in 1965. Hall won acclaim for his rich and complex compositions, especially for 1967's "In Cold Blood," and won an Academy Award for 1969's "Butch Cassidy and Sundance Kid." He won another Oscar, for American Beauty," in 2000. He was a son of the writer James Norman Hall, the author of "Mutiny on the Bounty." Krzysztof Ptak, film Director of photography and the director of Cinematography of film Edi, filmed more then 12 film productions. He studied history and philosophy at The Lodz University, and graduated from Directors Dept. Film School in Lodz, Poland. He came to Los Angeles and received the Golden Frog Award presented by Marek Zydowicz representing the International Film Festival of Art of Cinematography. Consul General of the Republic of Poland in LA, Krzysztof Kasprzyk, participated during the presentation of the Camerimage Award. Many guests from the film industry and art organizations were present: Wladek Juszkiewicz, President of The Polish Film Festival in Los Angeles; Piotr Trzaskalski, film director of Edi; Zbigniew Rybczynski, film director and Oscar laureate for film Tango; Jan Kaczmarek, composer; Peter Lucas; Piotr Andrzejewski actor; Jann Castor, composer; Mrs. and Dr. Tyszkiewicz; Ms. Jolanta Zych, President of the Modjeska Art and Culture Club in LA, and many Modjeska's Club members; Andrzej Kolodziej, Pres. of Krak; artists from Los Angeles and vicinity; Polish Radio in LA; News of Polonia and Glos-The Voice NYC. The interesting event and elegant reception was very well organized by Chris Wojciechowski, CW Entertainment. This event was sponsored by: Film Polski, Film Agency, President of the City of Lodz, Warta Towarzystwo Ubezpieczen & Reasekuracji S.A., and Zywiec Beer Amtek Int'l of NY Corp.